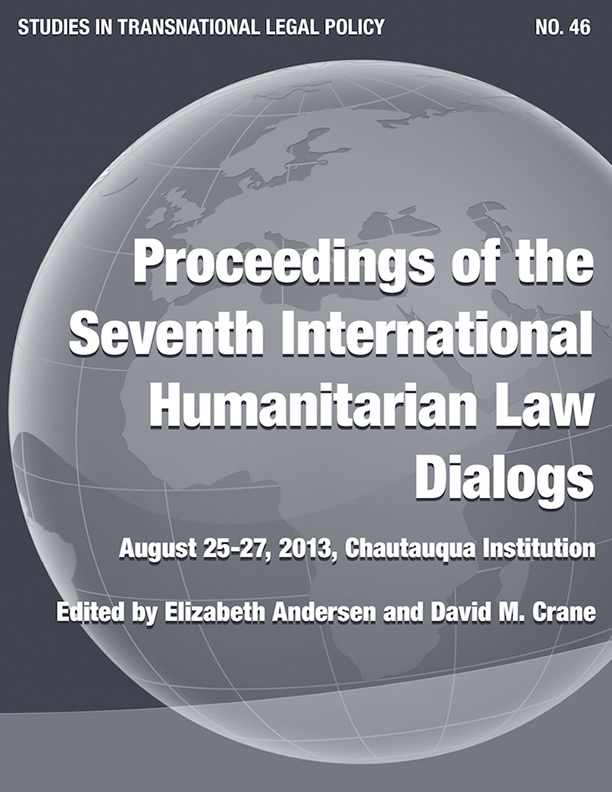 The Proceedings of the Eleventh International Humanitarian Law (IHL) Dialogs, which provides a print record of the 2017 meeting of international prosecutors, scholars, and students at the Chautauqua Institution in New York is now available. 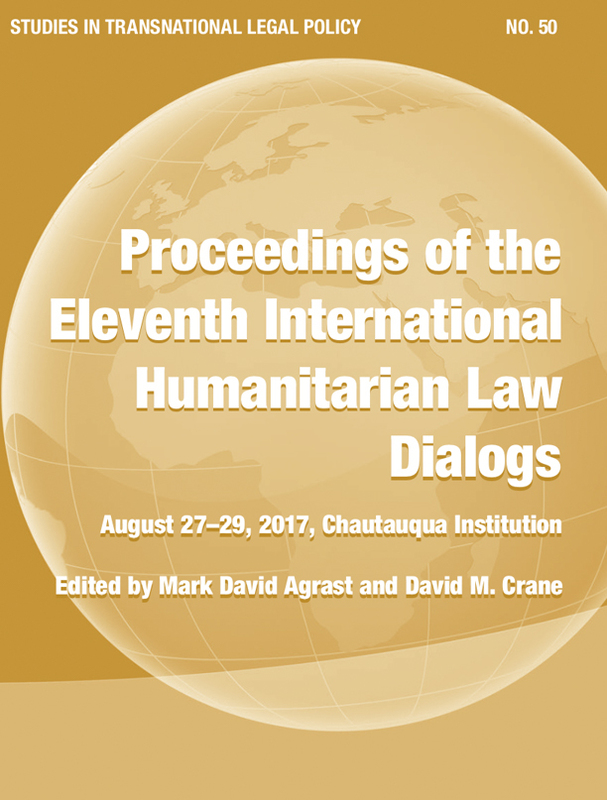 As a cosponsor of the annual IHL Dialogs, ASIL has published a written record of them every year since the first Dialogs in 2007.The theme of the Eleventh IHL Dialogs, held August 27–29, 2017, was "Changing Times: New Opportunities for International Justice and Accountability." Highlights of the volume include the Heintz Award Ceremony Keynote by Zainab Hawa Bangura, former U.N. Special Representative of the Secretary-General on Sexual Violence in Conflict; the Clara Barton Lecture by Elhadj As Sy, Secretary General of the International Federation of Red Cross and Red Crescent Societies; a discussion on the domestic investigation of war crimes and the role of the International Criminal Court (ICC) by Andrew Cayley, Director of Service Prosecutions in the U.K.; and updates from current and former prosecutors of the Extraordinary Chambers of the Courts of Cambodia, the International Criminal Court, the International Criminal Tribunals for Rwanda and Yugoslavia, the Special Court for Sierra Leone, and the Special Tribunal for Lebanon. Proceedings of the Tenth International Humanitarian Law (IHL) Dialogs is now available for purchase. The Proceedings of the tenth IHL Dialogs provides a print record of the 2016 meeting of international prosecutors, scholars, and students. 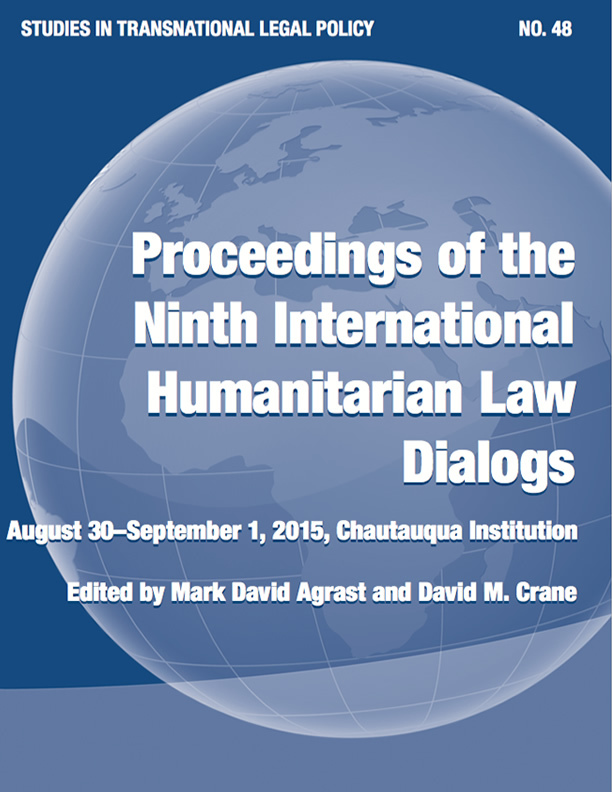 Usually held at the Chautauqua Institution in New York, the Tenth IHL Dialogs took place in Nuremberg, Germany. 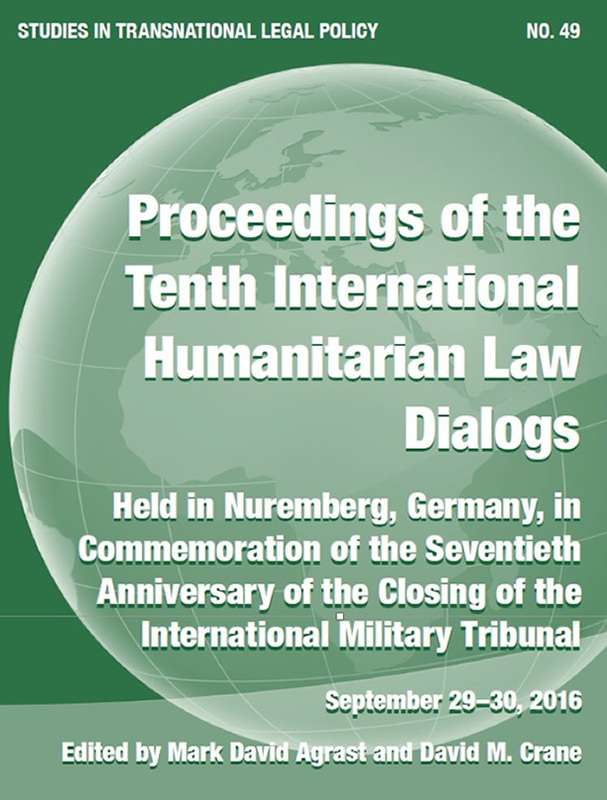 The theme of the Tenth IHL Dialogs, held September 29–30, 2016, was “A Lasting Legacy for the Future.” The theme commemorated the seventieth anniversary of the closing of the International Military Tribunal at Nuremberg. Highlights of the volume include a commemoration of the the seventieth anniversary of the Nuremberg trials by former U.S. Attorney General Loretta E. Lynch; a keynote address by Joseph Kamara, Deputy Prosecutor of the Special Court for Sierra Leone; updates from current prosecutors of the Extraordinary Chambers of the Courts of Cambodia, the International Criminal Court, the International Criminal Tribunal for Rwanda, the International Criminal Tribunal for the former Yugoslavia, the Special Court for Sierra Leone, and the Special Tribunal for Lebanon; a discussion on the arc of justice by the ICC Prosecutor Fatou Bensouda; and a roundtable on German perspectives of the Nazi crimes. 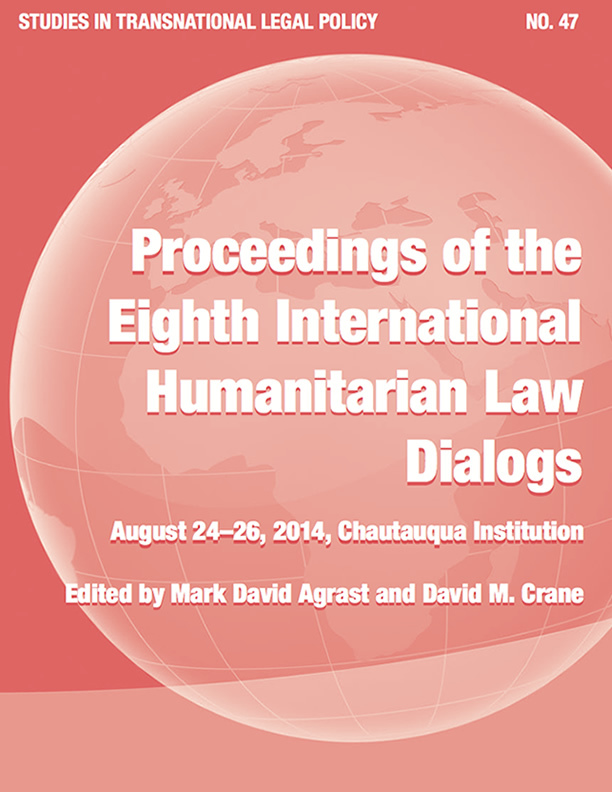 The Proceedings of the Ninth International Humanitarian Law Dialogs provides a print record of the ninth annual meeting of international prosecutors​, scholars, and students​ at the Chautauqua Institution, held from August 30 to September 1, 2015. The theme of the​ Ninth IHL Dialogs was “In Commemoration of the Srebrenica Massacre (1995) and the Opening of the International Military Tribunal at Nuremberg (1945).” Highlights of the volume include​:​ a keynote address by Hon. Patricia Wald;​ updates from current and former chief prosecutors of the ECCC, ICC, ICTR, ICTY, and SCSL ​;​ a roundtable discussion the Srebrenica Massacre; the fourth annual Clara Barton lecture by Claudia Paz y Paz; the fifth annual Katherine B. Fite lecture by Patricia Viseur Sellers; and ​a 2014–2015​ international criminal law​ “Year in Review” by Mark A. Drumbl. 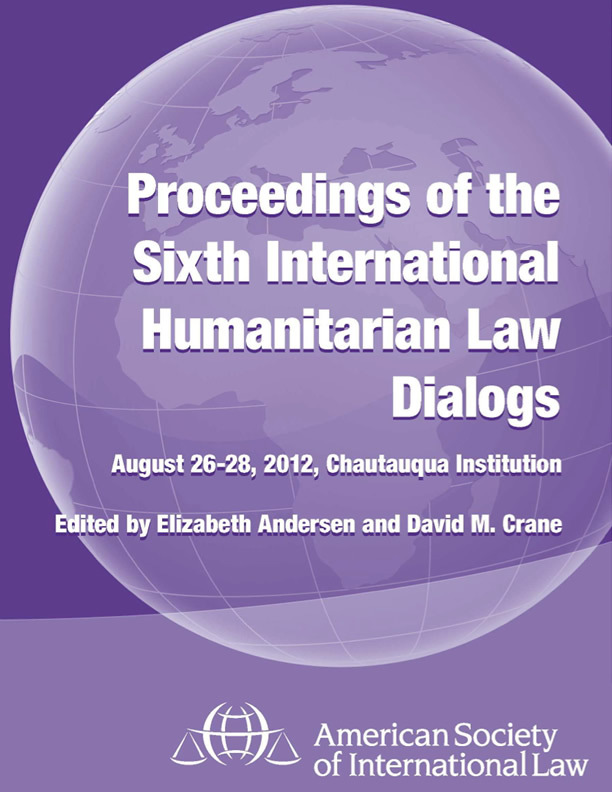 The Proceedings of the Eighth International Humanitarian Law Dialogs provides a print record of the eighth annual meeting of international prosecutors​, scholars, and students​ at Chautauqua Institution. The theme of the​ Eighth IHL Dialogs, held from from August 2​4​–26, 2014, was "The New World (Dis)​order: International Humanitarian Law in an Uncertain World.” Highlights of the volume include​:​ keynote addresses by Ambassador Tiina Intelmann and Col. Morris Davis (U.S. Air Force, ret. );​ updates from current prosecutors of the ECCC, ICC, ICTR, ICTY, and SCSL​;​ ​a 2013–2014​ international criminal law​ “Year in Review” by Valerie Oosterveld;​ ​​a roundtable discussion on the relevance of ​​in​ternational ​h​umanitarian ​l​aw in 2014​;​ and a conversation with Sir Desmond de Silva, Fatou Bensouda, and Hassan Jallow about the first international court in Africa. 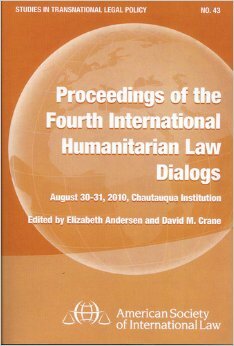 This boxed set consists of Proceedings of the Fifth International Humanitarian Law Dialogs, Studies in Transnational Legal Policy No. 44 and the four previous volumes. This volume provides a record of the proceedings of the seventh annual meeting of international prosecutors at Chautauqua Institution from August 25-27, 2013, focused on the theme "The Long Hot Summer After the Arab Spring: Accountability and the Rule of Law." The volume includes the prosecutors' updates regarding the activities of their respective courts and tribunals, the Third Annual Katherine B. Fite Lecture, the Second Annual Clara Barton Lecture, an interview with his Royal Highness Prince Zeid Ra'ad Zeid Al-Hussein, and a discussion of different perspectives on the Arab Spring. This volume provides a record of the proceedings of the fifth annual meeting of international prosecutors at Chautauqua Institution from August 28-30, 2011. The theme of these Dialogs was “Widespread and Systematic! – Crimes Against Humanity in the Shadow of Modern International Criminal Law.” The international prosecutors, academics, practitioners, and members of the public discussed the evolution of this crime and challenges in its prosecution. The Crimes Against Humanity Initiative, an initiative working towards the development and signing of an International Convention on the Prevention and Punishment of Crimes Against Humanity, is also presented, and its Proposed Convention is included in this volume. The volume also contains the prosecutors’ updates regarding the activities of their respective courts and tribunals during the past year. 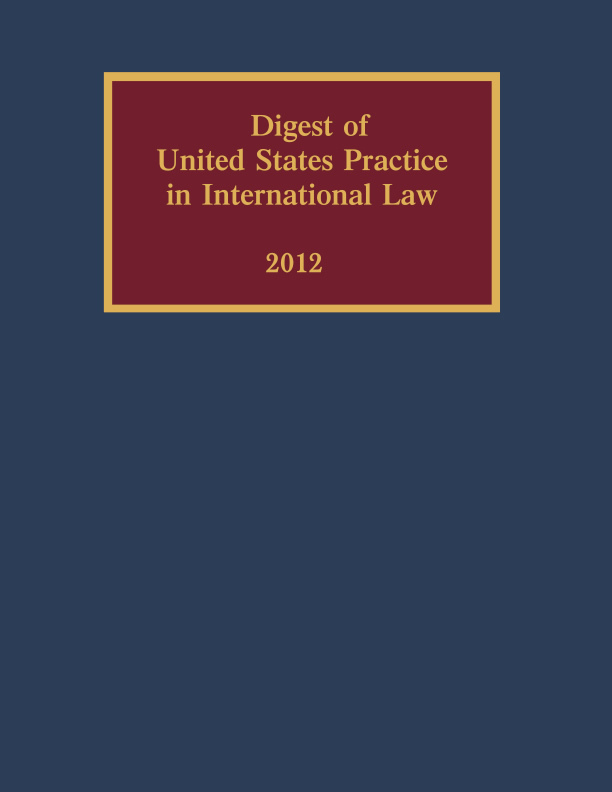 This volume provides a record of the proceedings of the fourth annual meeting of international prosecutors at Chautauqua Institution in August 2010. As the first major gathering of international criminal law experts following the International Criminal Court Review Conference in Kampala, the Dialogs provided the international prosecutors, judges, scholars, and others with an important forum in which to discuss the amendments to the crime of aggression, as well as the complexities of prosecuting such cases. The volume also contains the prosecutors' updates regarding the activities of their respective courts and tribunals during the past year. 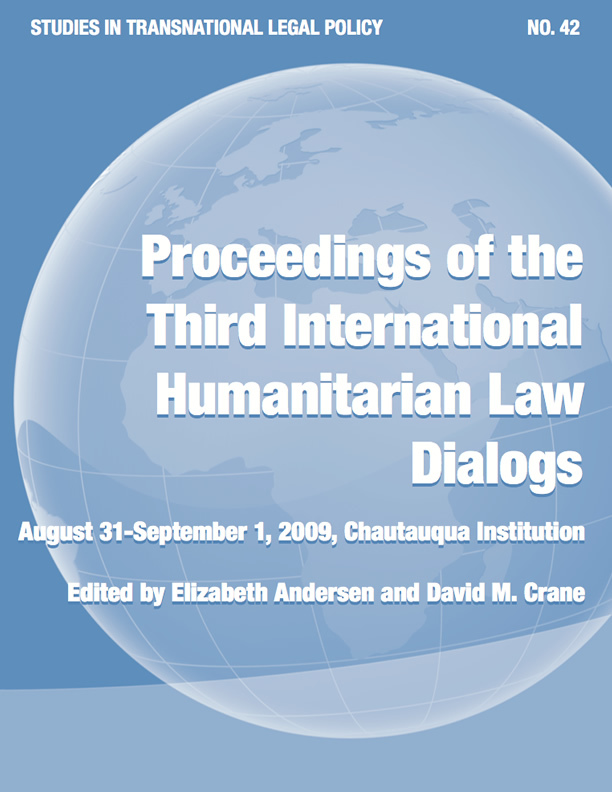 This volume provides a record of the proceedings of the third annual meeting of international prosecutors at the Chautauqua Institution from August 31 to September 1, 2009. Joined by an impressive group of experts, the international prosecutors discussed the important impact of women in international criminal law as well as the complexities of prosecuting gender-based crimes. Included are speeches and commemorative papers analyzing the sacrifices and contributions of women from Nuremberg to the present day. The Third Chautauqua Declaration is also included. This volume provides a record of the proceedings of the historic meeting of international prosecutors at the Chautauqua Institution on August 25-26, 2008. Included are speeches, commemorative papers, and summaries of dialogs. This volume provides a record of the proceedings of the historic meeting of international prosecutors at the Chautauqua Institution on August 29, 2007, in honor of the 100th anniversary of the Hague Rules of 1907. Included are speeches, commemorative papers, and summaries of dialogs on the history, procedure, and jurisprudence of international tribunals from Nuremberg to the International Criminal Court. The First Chautauqua Declaration is also included. From the historic launch of ASIL by such luminaries as Elihu Root and Charles Evans Hughes to the recent era when international law is increasingly in the public realm, The American Society of International Law's First Century: 1906-2006 by Frederic L. Kirgis traces the evolution of the Society and its relationship to events in the United States and around the world. Kirgis, who served as Secretary to the Society, is a member of the Board of Editors of the American Journal of International Law, spent more than a decade researching and writing this in-depth, 632-page history, which debuted at the Society's 100th annual meeting. This volume, drawing upon the expertise of its many contributors, provides guidance on how domestic law should advance the protection of Internally Displaced Persons (IDPs). The studies in this volume focus on specific IDP protection issues, ranging from the right to humanitarian assistance and the protection of family life to development-induced displacement and property rights. Incorporating the Guiding Principles on Internal Displacement into Domestic Law: Issues and Challenges builds on earlier ASIL-Brookings publications regarding the protection of IDPs, including the Guiding Principles on Internal Displacement: Annotations (Revised Edition) and the Guiding Principles on Internal Displacement and the Law of the South Caucasus.